Our Shop has a captive fully equipped machine shop. 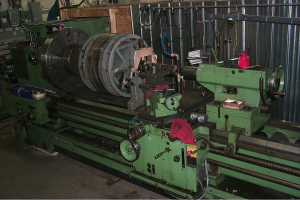 We use Lathes (up to 32” swing by 144” bed length), as well as a milling machine, cut off saw, surface grinder, and various other pieces of equipment. We also a utilize Sulzer Metco spray metal system to restore worn fits on shafts, bushings, seal surfaces etc. Typically we repair housings, turn and undercut commutators, and slip rings, repair shafts and shaft bearing fits, as well as keys, keyways, seal sleeves, impeller trimming etc. Having this equipment in house gives us better control over lead-time, and quality.